Pat McCormack President of the ICMSA. Over 60pc of Dairy Equipment Scheme (DES) grant aid went to farmers in Munster over the last four years, figures from the Department of Agriculture show. A total of €53m was paid out under the TAMS measure between 2015 and 2018, with more than €31m going to farmers in the southern province. Around a quarter of the approved funds went to Cork, with €12.3m being paid to more than 1,100 farmers in the county. The total number of applicants for the scheme over the four years was 4,875, with the average grant payment being €10,870. The overall payout under DES increased from €8m in 2015 to around €16m for 2016 and 2017. However, the impact of last year’s drought was reflected in a sharp drop in dairy sector investment, with grant approvals falling back to €12.56m. The high level of grant approvals in Munster – Cork, Tipperary, Kerry and Limerick have the highest levels of DES drawdowns – confirms that the bulk of the dairy expansion is still concentrated in the country’s traditional dairy heartlands. However, the figures show significant dairy investments were also made in the east and south, particularly, Meath, Laois, Kildare, Carlow, Kilkenny and Wexford. This region has seen a growing trend in dairy conversions among former suckler and tillage farmers. Grant approvals under the DES were slower in the west. However, there was strong activity in Galway where 176 applicants drew down €2m over the four years. In contrast, Leitrim and Sligo had the lowest levels of DES funding take-up, with grant approvals of €90,000 and €255,000 respectively. While Teagasc figures show that total gross investment on dairy farms in the eight years from 2010 to 2017 inclusive was €2.46bn, it is estimated that around €700m – or €2,000 per additional cow – went specifically on expansion during this period. The national dairy herd has grown by close to 350,000 cows since 2010, with numbers reaching 1.45 million last year and a further 30,000 cows forecast to join the herd this spring. In the same period, milk output has grown by 2.5 billion litres to hit 7.5 billion litres. The DES helped to fund much of this expansion. The grant scheme covers 40pc of the cost of a milking parlour and bulk tank expenditure up to a maximum spend of €80,000. For young, trained farmers, the grant rate is 60pc. The maximum grant is generally €32,000 but can go as high as €48,000 for young, trained farmers. Where a father and son are in partnership, the grant aid can total €80,000. ICMSA president Pat McCormack said the DES grant approval levels illustrated the level of investment farmers were making in their businesses. He pointed out that while the DES funding was very welcome, the grant payouts of €53m since 2015 were dwarfed by the €1bn invested by milk suppliers on their farms during this period. 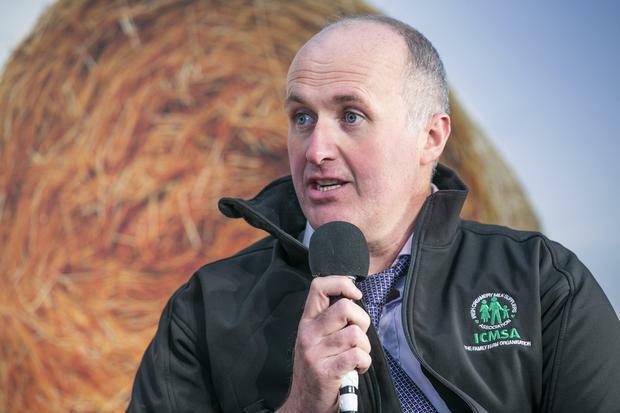 “On the basis of National Farm Survey figures, we see that in 2015 some €300m was invested on-farm, in 2016 that fell slightly to €250m, in 2017 that jumped to €400m and, though the figures aren’t available for 2018, we expect that figure to be back considerably due to uncertainty and lower prices,” Mr McCormack said. He added that this investment has a “multiplier effect” for local businesses and the rural economy and was a “motor” that powered further growth right across the country.